The Christmas Pippin Apple Tree is a delicious, juicy, thin-skinned apple with aromatic flesh. 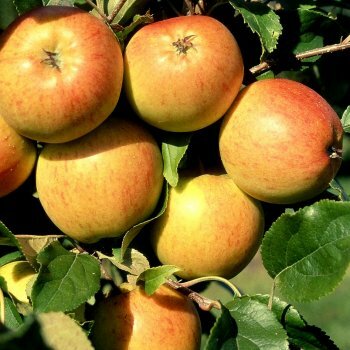 The Christmas Pippin Apple is similar in flavour to the popular Cox's Apple but easier to grow. Raised from seed in 2000 this tasty apple is moreish and bound to become a popular treat in everyone’s lunch box! Christmas Pippin is a group B apple tree and requires a suitable pollinator within a 1/2 mile radius. Apple trees should be spaced according to their rootstock, for example an MM106 (semi-vigorous) rootstock will require approx. 4.5 metres between trees, whereas an M27 (very dwarf) rootstock will require approx. 1.5 metres between trees.